There's plenty of buzz around Ronny Harper as he sits, a week out from his Feb. 11th fight against Daniel Baynton. Harper holds the 145-pound Nemesis Fight Alliance belt and the bout will be the co-main event for the night for Contender Takeover. But when the lights are up, the crowds on their feet and all eyes are on the cage, where will you find Harper? Ill be in the back sleeping, he said. That cool, carefree approach the 24-year-old brings to the cage is the same he brings to life; hes having fun, living life to the fullest, and collecting belts along the way. But along with that enjoy-the-moment attitude comes a determined presence that is on display both in the cage and out. Growing up in Granite City, Illinois comes with a reputation, especially when youre a star wrestler through school. In only his second year, Harper won 34 straight teen meets and 14 tournaments before losing his only match that year at the state competition. People think Granite Citys a place where you have to be tough just to survive, its not like that at all, he said. Maybe not for Harper, but with all the fresh talent coming from Granite City, its hard not to think theres something to that idea. Harper has always prided himself as someone who marches to the beat of his own drum. Ive always been more of a let-me-do-my-thing kind of guy, said Harper. Ive never liked the idea of having to count on somebody else. Its that fierce, individualistic spirit along with his father-figure mentality which led to the creation of Granite City MMA, Harper's proving ground for him and his friends in the basement of his house where they train. We werent getting treated fairly by the people putting the fights together, Harper said. So I started my own gym. Before too long, Harper started making a name for himself in the world of MMA. His 8-4 record barely reflects the excitement and energy he brings to the cage. At the Proud n Loud Event, Harper was scheduled to fight on the undercard when he was offered a shot at a title belt against Chicago-native Vaughn Camacho. Of course Harper jumped at the opportunity and at 0:51 in the first round a power slam gave Harper the title belt. 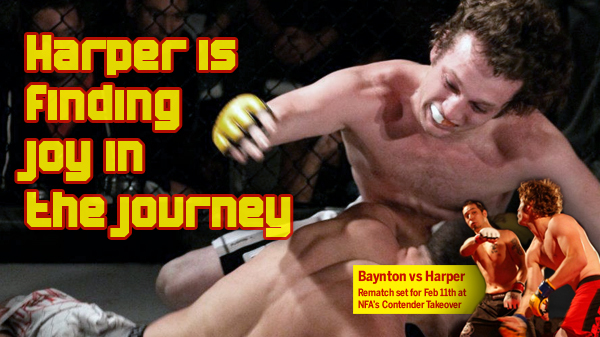 The 5-foot-10 Harper knows he will have his hands full against Baynton. Their last match up at Nemesis Fighting Alliances Fight to Work event on October 8th ended in 1:48 with a tap out in Harper's favor. Since then Harpers had some time to reflect. He can take a punch, thats for sure, Harper said of Baynton. Hell take a hundred punches trying to get that armbar in. And hes good at. One things certain, Harpers focused, excited and looking forward to meeting Baynton again. Just make sure and wake him up before the fight starts. The Contender Takeover, held at Teamsters Local No. 6, 3650 Wisconsin Street in St. Louis, will feature over 15 amateur bouts. Doors open at 5:30 with fights slated to begin at 7p.m.